Elizabeth Eulberg is one of my favorite contemporary YA authors. I fell in love with her when I read Prom and Prejudice. Her third book, Take A Bow is just as wonderful! (although I have a soft spot in my heart for Prom and Prejudice). 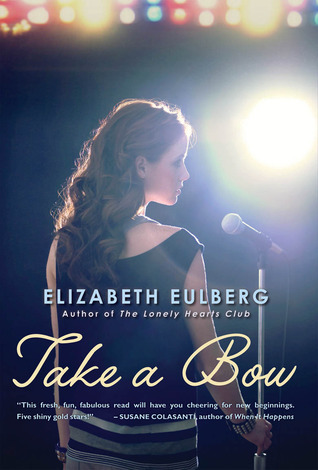 Take A Bow is ostensibly a book about senior year at an uber-competitive performing arts school. But really, it's a character study of four friends and classmates. Writing a book from four points of view is always a dicey method for an author. The risk of confusion is high. But Ethan, Emme, Carter, and Sophie are such distinctive personalities that I never had trouble telling them apart. The characters come to life in such a way that I was cheering and jeering alongside each of them. Sophie is the most difficult character to like. She's the type of girl you hate - the one who gleefully steps on people's backs with her pointy stilettos to get what she wants. She treats her long-suffering best friend terribly and is only after her boyfriend for the fame. At the same time, I did feel sorry for her - she went from being the big fish to one of many big fish and couldn't deal with it. I also admired her endless determination. She is probably the most one dimensional character, yet I think everyone knows someone like her. Emme is Sophie's much maligned best friend. She wastes all her talents on writing songs for Sophie and gets none of the credit. I spent much of the book wanting to slap her. She is so sweet and naive that it made me sick. Even a five year old could recognize that Sophie was using her, yet Emme strolled through life with blinders on. But it's hard to remain angry at such a genuine girl. Take A Bow could also be called "Emme Grows A Back-Bone". Emme was lucky to have a group of real friends who helped her emerge from her thick Sophie shell and realize her own talents. Ethan is a damaged but lovable song-writer. Very emo. He's amazingly talented, but his own demons get in the way of his success. I wanted to hug him throughout most of the book. He drinks too much and cheats on his girlfriend endlessly, but he is a kind, quiet, haunted personality. He desperately needed help. Despite being a train wreck, I wanted Ethan to succeed and find happiness at everything. Ethan is the male version of Emme - trapped by his low self-esteem. Carter was probably my favorite. He's a child star of a long running soap opera who got into CPA by virtue of his name alone. He gets all the best roles despite having less talent than his classmates. What makes me love Carter, is that he recognizes this and hates it. He wants something more out of life than being a child actor. He could be a stuck up snob, but Carter was funny, sardonic, self-deprecating, and kind. I loved watching him find his own way through the novel. I especially loved that his sections of the novel were written in screen-play form. It made his character stand out. I highly recommend Take A Bow. It's a fun, easy read about a life that few of us will ever experience. Elizabeth Eulberg does such a wonderful job at creating four different characters suffering from realistic pressures that I felt like I was experiencing the CPA world for real alongside Emma, Carter, Ethan, and Sophie. I can't wait to read what Elizabeth writes next! I've been meaning to try Eulberg's books and I think I might start with this one. I like the sound of the characters and I'm so glad that Emme grew a backbone! I purposely skipped Prom and Prejudice. I try to avoid all retellings of Pride and Prejudice not because I don't like the story but because it's *so* overdone. I've read three Eulberg novels now. Prom and Prejudice, The Lonely Hearts Club and Revenge of the Girl with the Great Personality. Revenge wasn't my favorite, but I enjoyed Prom and Hearts Club. I don't know why I haven't read this one yet. I've heard great things about it. I'm never realyl drawn to books about performing arts schools, so that might be why I haven't gotten to it. I'm still not sure I want to read this though, even with your positive review. Sophie would get on my nerves, and Emme! Yeah, I'm pretty sure i'd want to scream at her. But I am very intrigued by Carter. This is one book that I have been wanting to read for a long time. I have read so many awesome reviews on it. Thanks for sharing. Oh, EMO!! My students love/hate emo (they "hate" it in real life but lap it up in books) so that means I need to check this out. Besides the 4 stars from you, of course! Ethan sounds like exactly my kind of character, I think I would fall for him hard. I haven't read anything by Eulberg, but I should try. This sounds great! I haven't read many very many reviews, and I loved Prom & Prejudice, so I'm sure I'd have fun with this too. Fabulous review, thanks for sharing! This sounds great! I've only read 1 other of Elizabeth's books, but I definitely want to read this. I haven't read any of Eulberg's books so I guess I need to change that soon. Maybe I'll start with Prom and Prejudice then if you have a soft spot for that one. I do like the sound of this one and love when books have multiple POVs. The problem with a variety of POVs though it that not all authors can do it successfully, but it sounds like Eulberg can if all the characters remain distinctive. Carter was my favorite character too! Glad to read someone else who agreed with me. This was not my favorite Eulberg book though-I preferred her early ones. I have not yet read a book by Eulberg yet but, I have a few of them on my kindle and I am definitely excited about diving in. Great review!